The CoffeeShop Blog: CoffeeShop CutOuts 2: Decorative Digital Brads! CoffeeShop CutOuts 2: Decorative Digital Brads! I hope everyone had a wonderful Thanksgiving! We had a great time celebrating with our family in our newly decorated (if not completely finished) dining and living rooms. I will post photos later on our updated look. I love how it has turned out and can't wait to finish both rooms. I also wanted to mention that Sassy Designs is having an 80% off sale this weekend. You can pick up some beautiful digital papers. I am in the process of changing internet providers, so my internet time will be hit or miss the next day or two. We can't get fast speed internet on our street yet (the neighbors down the road have it...) so I am going from 3G wireless to 4G wirelss and I hope it works. I have to move my computer and that is going to be a huge mess since I have a million wires. I am typing this post while sitting on the ground. But on to my freebie. I am trying to create some digital design elements you can use on your holiday card-making. Here is another set of digital designs called CoffeeShop CutOuts 2. This set includes 6 decorative brads in .png format (so the background is transparent) that you can use in your cards, storyboards, etc. These are photographs of vintage 70's pulls on my closet doors. I used them on the frames/cards I posted the other day. I hope you enjoy these! 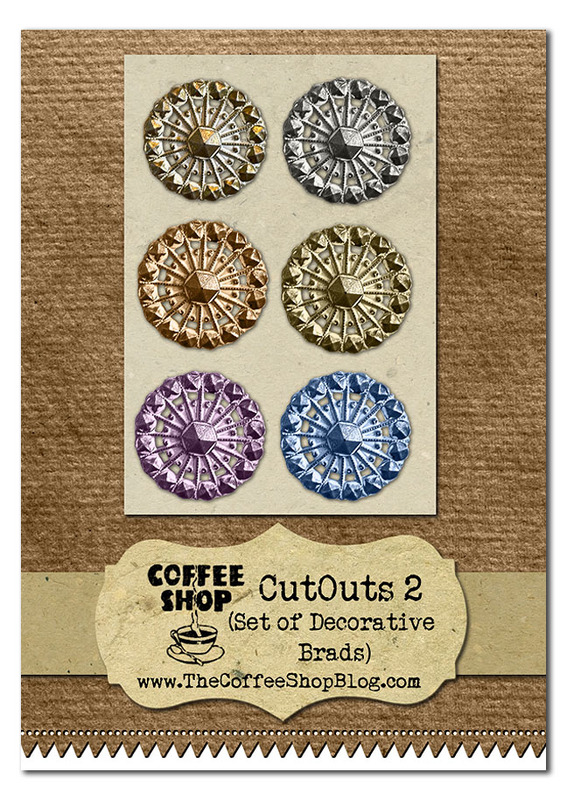 Download the free CoffeeShop CutOuts 2 set! These are SO cute, Rita! Thanks! Thank you so much for this post. I want to let you know that I posted a link to your blog in CBH Digital Scrapbooking Freebies, under the Page 4 post on Nov. 28, 2010. Thanks again. Thank you so much for this post. I want to let you know that I posted a link to your blog in CBH Digital Scrapbooking Freebies, under the Page 3 post on Nov. 28, 2010. Thanks again. brads with a classy touch , nice style , thanks ! Just discovered your site and I'm so impressed. Thanks for these wonderful resources.